As part of their major Season 3 update for Destiny 2, Bungie will make it slightly easier to pick up dances, ghosts, and ships from the new Prismatic Matrix loot box system. In their latest This Week At Bungie Update, the developer gave us the rundown on the new loot box system, which will feature 10 items every week, and will not drop duplicate items. So if you pick up ten Matrices in a week, you’ll receive every reward for that week. 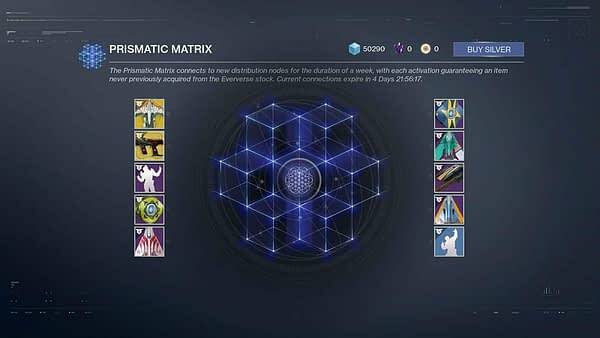 Items dropped from Bright Engrams (which players earn from leveling up) or bought with Bright Dust (the currency gained from dismantling vanity items) also count against the duplicate counter, which means the new Matrices will be the last rewards you’ll want to earn during a week to guarantee yourself the highest chance of earning a new item. In order to receive a reward from the Matrix, players will need a Prismatic Facet, which they will earn once per week after their first level-up. They can then buy additional Facets for 200 silver (the real-money equivalent). “We want to continue experimenting and evolving Eververse to improve player experience, and give more paths to earn Eververse rewards,” Bungie said in the blog post. This is part of a longer effort from Bungie to reduce to overall randomness in rewards players earn in Destiny 2. In January, it made vanity rewards a part of regular player activities, making the path to picking up vanity items feel more like something you earn rather than simply gained at random. In other Destiny 2 news, the game’s second expansion Warmind will bring a higher, harder-to-reach power cap. Meanwhile, the unnamed Fall expansion will bring with it a new game mode Activision claims is new to first-person shooters.